For other uses of etch or etching, see Etching (disambiguation). For the history of the method, see old master prints. Christ Preaching, known as The Hundred Guilder Print , an etching by Rembrandt (ca. 1648). Rembrandt is generally considered the greatest etcher in the history of the medium (as an art in its own right). His most important contribution in the history of printmaking was his transformation of the 17th-century etching process from a hitherto relatively new craft into a truly admired art form in subsequent centuries, especially in the 19th century. Etching is traditionally the process of using strong acid or mordant to cut into the unprotected parts of a metal surface to create a design in intaglio (incised) in the metal. In modern manufacturing, other chemicals may be used on other types of material. As a method of printmaking, it is, along with engraving, the most important technique for old master prints, and remains in wide use today. In a number of modern variants such as microfabrication etching and photochemical milling it is a crucial technique in much modern technology, including circuit boards. An acid is a molecule or ion capable of donating a hydron (proton or hydrogen ion H+), or, alternatively, capable of forming a covalent bond with an electron pair (a Lewis acid). A mordant or dye fixative is a substance used to set dyes on fabrics by forming a coordination complex with the dye, which then attaches to the fabric. It may be used for dyeing fabrics or for intensifying stains in cell or tissue preparations. As applied to textiles, mordants are mainly of historical interest because the use of mordant dyes was largely displaced by directs. 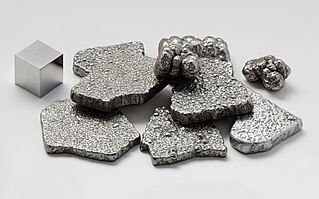 A metal is a material that, when freshly prepared, polished, or fractured, shows a lustrous appearance, and conducts electricity and heat relatively well. Metals are typically malleable or ductile. A metal may be a chemical element such as iron, or an alloy such as stainless steel. In traditional pure etching, a metal (usually copper, zinc or steel) plate is covered with a waxy ground which is resistant to acid. The artist then scratches off the ground with a pointed etching needle  where he or she wants a line to appear in the finished piece, so exposing the bare metal. The échoppe, a tool with a slanted oval section, is also used for "swelling" lines. The plate is then dipped in a bath of acid, technically called the mordant (French for "biting") or etchant, or has acid washed over it. The acid "bites" into the metal (it dissolves part of the metal) where it is exposed, leaving behind lines sunk into the plate. The remaining ground is then cleaned off the plate. The plate is inked all over, and then the ink wiped off the surface, leaving only the ink in the etched lines. The plate is then put through a high-pressure printing press together with a sheet of paper (often moistened to soften it). The paper picks up the ink from the etched lines, making a print. The process can be repeated many times; typically several hundred impressions (copies) could be printed before the plate shows much sign of wear. The work on the plate can also be added to by repeating the whole process; this creates an etching which exists in more than one state. A printing press is a mechanical device for applying pressure to an inked surface resting upon a print medium, thereby transferring the ink. It marked a dramatic improvement on earlier printing methods in which the cloth, paper or other medium was brushed or rubbed repeatedly to achieve the transfer of ink, and accelerated the process. Typically used for texts, the invention and global spread of the printing press was one of the most influential events in the second millennium. In printmaking, a state is a different form of a print, caused by a deliberate and permanent change to a matrix such as a copper plate or woodblock. Etching has often been combined with other intaglio techniques such as engraving (e.g., Rembrandt) or aquatint (e.g., Francisco Goya). Intaglio is the family of printing and printmaking techniques in which the image is incised into a surface and the incised line or sunken area holds the ink. It is the direct opposite of a relief print. Rembrandt Harmenszoon van Rijn was a Dutch draughtsman, painter and printmaker. An innovative and prolific master in three media, he is generally considered one of the greatest visual artists in the history of art and the most important in Dutch art history. 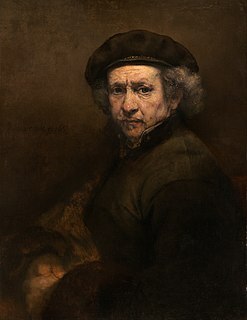 Unlike most Dutch masters of the 17th century, Rembrandt's works depict a wide range of style and subject matter, from portraits and self-portraits to landscapes, genre scenes, allegorical and historical scenes, biblical and mythological themes as well as animal studies. His contributions to art came in a period of great wealth and cultural achievement that historians call the Dutch Golden Age, when Dutch art, although in many ways antithetical to the Baroque style that dominated Europe, was extremely prolific and innovative, and gave rise to important new genres. Like many artists of the Dutch Golden Age, such as Jan Vermeer of Delft, Rembrandt was also an avid art collector and dealer. Etching by goldsmiths and other metal-workers in order to decorate metal items such as guns, armour, cups and plates has been known in Europe since the Middle Ages at least, and may go back to antiquity. The elaborate decoration of armour, in Germany at least, was an art probably imported from Italy around the end of the 15th century—little earlier than the birth of etching as a printmaking technique. Printmakers from the German-speaking lands and Central Europe perfected the art and transmitted their skills over the Alps and across Europe. A goldsmith is a metalworker who specializes in working with gold and other precious metals. Historically, goldsmiths also have made silverware, platters, goblets, decorative and serviceable utensils, ceremonial or religious items, and rarely using Kintsugi, but the rising prices of precious metals have curtailed the making of such items to a large degree. Daniel Hopfer was a German artist who is widely believed to have been the first to use etching in printmaking, at the end of the fifteenth century. He also worked in woodcut. 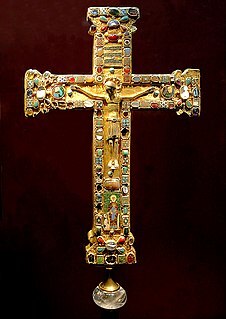 The Germanisches Nationalmuseum is a museum in Nuremberg, Germany. Founded in 1852, it houses a large collection of items relating to German culture and art extending from prehistoric times through to the present day. The Germanisches Nationalmuseum is Germany's largest museum of cultural history. Out of its total holding of some 1.3 million objects, approximately 25,000 are exhibited. The switch to copper plates was probably made in Italy, and thereafter etching soon came to challenge engraving as the most popular medium for artists in printmaking. Its great advantage was that, unlike engraving where the difficult technique for using the burin requires special skill in metalworking, the basic technique for creating the image on the plate in etching is relatively easy to learn for an artist trained in drawing. On the other hand, the handling of the ground and acid need skill and experience, and are not without health and safety risks, as well as the risk of a ruined plate. Jacques Callot (1592–1635) from Nancy in Lorraine (now part of France) made important technical advances in etching technique. He developed the échoppe, a type of etching-needle with a slanting oval section at the end, which enabled etchers to create a swelling line, as engravers were able to do. Callot also appears to have been responsible for an improved, harder, recipe for the etching ground, using lute-makers' varnish rather than a wax-based formula. This enabled lines to be more deeply bitten, prolonging the life of the plate in printing, and also greatly reducing the risk of "foul-biting", where acid gets through the ground to the plate where it is not intended to, producing spots or blotches on the image. Previously the risk of foul-biting had always been at the back of an etcher's mind, preventing too much time on a single plate that risked being ruined in the biting process. Now etchers could do the highly detailed work that was previously the monopoly of engravers, and Callot made full use of the new possibilities. Callot also made more extensive and sophisticated use of multiple "stoppings-out" than previous etchers had done. This is the technique of letting the acid bite lightly over the whole plate, then stopping-out those parts of the work which the artist wishes to keep light in tone by covering them with ground before bathing the plate in acid again. He achieved unprecedented subtlety in effects of distance and light and shade by careful control of this process. Most of his prints were relatively small—up to about six inches or 15 cm on their longest dimension, but packed with detail. One of his followers, the Parisian Abraham Bosse, spread Callot's innovations all over Europe with the first published manual of etching, which was translated into Italian, Dutch, German and English. The 17th century was the great age of etching, with Rembrandt, Giovanni Benedetto Castiglione and many other masters. In the 18th century, Piranesi, Tiepolo and Daniel Chodowiecki were the best of a smaller number of fine etchers. In the 19th and early 20th century, the Etching revival produced a host of lesser artists, but no really major figures. Etching is still widely practiced today. Aquatint uses acid-resistant resin to achieve tonal effects. Soft-ground etching uses a special softer ground. The artist places a piece of paper (or cloth etc. in modern uses) over the ground and draws on it. The print resembles a drawing. Relief etching was invented by William Blake in about 1788, and he has been almost the only artist to use it in its original form. However, from 1880–1950 a photo-mechanical ("line-block") variant was the dominant form of commercial printing for images. A similar process to etching, but printed as a relief print, so it is the "white" background areas which are exposed to the acid, and the areas to print "black" which are covered with ground. Blake's exact technique remains controversial. He used the technique to print texts and images together, writing the text and drawing lines with an acid-resistant medium. A waxy acid-resist, known as a ground, is applied to a metal plate, most often copper or zinc but steel plate is another medium with different qualities. There are two common types of ground: hard ground and soft ground. Hard ground can be applied in two ways. Solid hard ground comes in a hard waxy block. To apply hard ground of this variety, the plate to be etched is placed upon a hot-plate (set at 70 degrees C), a kind of metal worktop that is heated up. The plate heats up and the ground is applied by hand, melting onto the plate as it is applied. The ground is spread over the plate as evenly as possible using a roller. Once applied the etching plate is removed from the hot-plate and allowed to cool which hardens the ground. After the ground has hardened the artist "smokes" the plate, classically with 3 beeswax tapers, applying the flame to the plate to darken the ground and make it easier to see what parts of the plate are exposed. Smoking not only darkens the plate but adds a small amount of wax. Afterwards the artist uses a sharp tool to scratch into the ground, exposing the metal. The second way to apply hard ground is by liquid hard ground. This comes in a can and is applied with a brush upon the plate to be etched. Exposed to air the hard ground will harden. Some printmakers use oil/tar based asphaltum  or bitumen as hard ground, although often bitumen is used to protect steel plates from rust and copper plates from aging. Soft ground also comes in liquid form and is allowed to dry but it does not dry hard like hard ground and is impressionable. After the soft ground has dried the printmaker may apply materials such as leaves, objects, hand prints and so on which will penetrate the soft ground and expose the plate underneath. The ground can also be applied in a fine mist, using powdered rosin or spraypaint. This process is called aquatint, and allows for the creation of tones, shadows, and solid areas of color. The design is then drawn (in reverse) with an etching-needle or échoppe. An "echoppe" point can be made from an ordinary tempered steel etching needle, by grinding the point back on a carborundum stone, at a 45–60 degree angle. The "echoppe" works on the same principle that makes a fountain pen's line more attractive than a ballpoint's: The slight swelling variation caused by the natural movement of the hand "warms up" the line, and although hardly noticeable in any individual line, has a very attractive overall effect on the finished plate. It can be drawn with in the same way as an ordinary needle. The plate is then completely submerged in a solution that eats away at the exposed metal. Ferric chloride may be used for etching copper or zinc plates, whereas nitric acid may be used for etching zinc or steel plates. Typical solutions are 1 part FeCl3 to 1 part water and 1 part nitric to 3 parts water. The strength of the acid determines the speed of the etching process. The etching process is known as biting (see also spit-biting below). The waxy resist prevents the acid from biting the parts of the plate which have been covered. The longer the plate remains in the acid the deeper the "bites" become. During the etching process the printmaker uses a bird feather or similar item to wave away bubbles and detritus produced by the dissolving process, from the surface of the plate, or the plate may be periodically lifted from the acid bath. If a bubble is allowed to remain on the plate then it will stop the acid biting into the plate where the bubble touches it. Zinc produces more bubbles much more rapidly than copper and steel and some artists use this to produce interesting round bubble-like circles within their prints for a Milky Way effect. The detritus is powdery dissolved metal that fills the etched grooves and can also block the acid from biting evenly into the exposed plate surfaces. Another way to remove detritus from a plate is to place the plate to be etched face down within the acid upon plasticine balls or marbles, although the drawback of this technique is the exposure to bubbles and the inability to remove them readily. For aquatinting a printmaker will often use a test strip of metal about a centimetre to three centimetres wide. The strip will be dipped into the acid for a specific number of minutes or seconds. The metal strip will then be removed and the acid washed off with water. Part of the strip will be covered in ground and then the strip is redipped into the acid and the process repeated. The ground will then be removed from the strip and the strip inked up and printed. This will show the printmaker the different degrees or depths of the etch, and therefore the strength of the ink color, based upon how long the plate is left in the acid. The plate is removed from the acid and washed over with water to remove the acid. The ground is removed with a solvent such as turpentine. Turpentine is often removed from the plate using methylated spirits since turpentine is greasy and can affect the application of ink and the printing of the plate. Spit-biting is a process whereby the printmaker will apply acid to a plate with a brush in certain areas of the plate. The plate may be aquatinted for this purpose or exposed directly to the acid. The process is known as "spit"-biting due to the use of saliva once used as a medium to dilute the acid, although gum arabic or water are now commonly used. A piece of matte board, a plastic "card", or a wad of cloth is often used to push the ink into the incised lines. The surface is wiped clean with a piece of stiff fabric known as tarlatan and then wiped with newsprint paper; some printmakers prefer to use the blade part of their hand or palm at the base of their thumb. The wiping leaves ink in the incisions. You may also use a folded piece of organza silk to do the final wipe. If copper or zinc plates are used, then the plate surface is left very clean and therefore white in the print. If steel plate is used, then the plate's natural tooth gives the print a grey background similar to the effects of aquatinting. As a result, steel plates do not need aquatinting as gradual exposure of the plate via successive dips into acid will produce the same result. A damp piece of paper is placed over the plate and it is run through the press. Growing concerns about the health effects of acids and solvents   led to the development of less toxic etching methods  in the late 20th century. An early innovation was the use of floor wax as a hard ground for coating the plate. Others, such as printmakers Mark Zaffron and Keith Howard, developed systems using acrylic polymers as a ground and ferric chloride for etching. The polymers are removed with sodium carbonate (washing soda) solution, rather than solvents. When used for etching, ferric chloride does not produce a corrosive gas, as acids do, thus eliminating another danger of traditional etching. The traditional aquatint, which uses either powdered rosin or enamel spray paint, is replaced with an airbrush application of the acrylic polymer hard ground. Again, no solvents are needed beyond the soda ash solution, though a ventilation hood is needed due to acrylic particulates from the air brush spray. The traditional soft ground, requiring solvents for removal from the plate, is replaced with water-based relief printing ink. The ink receives impressions like traditional soft ground, resists the ferric chloride etchant, yet can be cleaned up with warm water and either soda ash solution or ammonia. Anodic etching has been used in industrial processes for over a century. The etching power is a source of direct current. The item to be etched (anode) is connected to its positive pole. A receiver plate (cathode) is connected to its negative pole. Both, spaced slightly apart, are immersed in a suitable aqueous solution of a suitable electrolyte. The current pushes the metal out from the anode into solution and deposits it as metal on the cathode. Shortly before 1990, two groups working independently   developed different ways of applying it to creating intaglio printing plates. In the patented   Electroetch system, invented by Marion and Omri Behr, in contrast to certain nontoxic etching methods, an etched plate can be reworked as often as the artist desires     The system uses voltages below 2 volts which exposes the uneven metal crystals in the etched areas resulting in superior ink retention and printed image appearance of quality equivalent to traditional acid methods. With polarity reversed the low voltage provides a simpler method of making mezzotint plates as well as the "steel facing"  copper plates. Some of the earliest printmaking workshops experimenting with, developing and promoting nontoxic techniques include Grafisk Eksperimentarium, in Copenhagen, Denmark, Edinburgh Printmakers, in Scotland, and New Grounds Print Workshop, in Albuquerque, New Mexico. Light sensitive polymer plates allow for photorealistic etchings. A photo-sensitive coating is applied to the plate by either the plate supplier or the artist. Light is projected onto the plate as a negative image to expose it. Photopolymer plates are either washed in hot water or under other chemicals according to the plate manufacturers' instructions. Areas of the photo-etch image may be stopped-out before etching to exclude them from the final image on the plate, or removed or lightened by scraping and burnishing once the plate has been etched. Once the photo-etching process is complete, the plate can be worked further as a normal intaglio plate, using drypoint, further etching, engraving, etc. The final result is an intaglio plate which is printed like any other. Copper is a traditional metal, and is still preferred, for etching, as it bites evenly, holds texture well, and does not distort the color of the ink when wiped. Zinc is cheaper than copper, so preferable for beginners, but it does not bite as cleanly as copper does, and it alters some colors of ink. Steel is growing in popularity as an etching substrate. Increases in the prices of copper and zinc have steered steel to an acceptable alternative. The line quality of steel is less fine than copper, but finer than zinc. Steel has a natural and rich aquatint. The type of metal used for the plate impacts the number of prints the plate will produce. The firm pressure of the printing press slowly rubs out the finer details of the image with every pass-through. With relatively soft copper, for example, the etching details will begin to wear very quickly, some copper plates show extreme wear after only ten prints. Steel, on the other hand, is incredibly durable. This wearing out of the image over time is one of the reasons etched prints created early in a numbered series tend to be valued more highly. An artist thus takes the total number of prints he or she wishes to produce into account whenever choosing the metal. Etching is also used in the manufacturing of printed circuit boards and semiconductor devices, and in the preparation of metallic specimens for microscopic observation. There are many ways for the printmaker to control the acid's effects. Most typically, the surface of the plate is covered in a hard, waxy 'ground' that resists acid. The printmaker then scratches through the ground with a sharp point, exposing lines of metal which the mordant acid attacks. Aquatint is a variation giving only tone rather than lines when printed. Particulate resin is evenly distributed on all or parts of the plate, then heated to form a screen ground of uniform, but less than perfect, density. After etching, any exposed surface will result in a roughened (i.e., darkened) surface. Areas that are to be light in the final print are protected by varnishing between acid baths. Successive turns of varnishing and placing the plate in acid create areas of tone difficult or impossible to achieve by drawing through a wax ground. Here designs in a syrupy solution of sugar or Camp Coffee are painted onto the metal surface prior to it being coated in a liquid etching ground or 'stop out' varnish. When later the plate is placed in hot water the sugar dissolves and lifts off leaving the image. The plate can then be etched. A mixture of nitric acid and Gum Arabic (or almost never – saliva) which can be dripped, spattered or painted onto a metal surface giving interesting results. A mixture of nitric acid and rosin can also be used. Printing the plate is done by covering the surface with printing ink, then rubbing the ink off the surface with tarlatan cloth or newsprint, leaving ink in the roughened areas and lines. Damp paper is placed on the plate, and both are run through a printing press; the pressure forces the paper into contact with the ink, transferring the image (c.f., chine-collé). Unfortunately, the pressure also subtly degrades the image in the plate, smoothing the roughened areas and closing the lines; a copper plate is good for, at most, a few hundred printings of a strongly etched imaged before the degradation is considered too great by the artist. At that point, the artist can manually restore the plate by re-etching it, essentially putting ground back on and retracing their lines; alternatively, plates can be electro-plated before printing with a harder metal to preserve the surface. Zinc is also used, because as a softer metal, etching times are shorter; however, that softness also leads to faster degradation of the image in the press. Foul-bite or "over-biting" is common in etching, and is the effect of minuscule amounts of acid leaking through the ground to create minor pitting and burning on the surface. This incidental roughening may be removed by smoothing and polishing the surface, but artists often leave faux-bite, or deliberately court it by handling the plate roughly, because it is viewed as a desirable mark of the process. The phrase "Want to come up and see my etchings?" is a romantic euphemism by which a person entices someone to come back to their place with an offer to look at something artistic, but with ulterior motives. The phrase is a corruption of some phrases in a novel by Horatio Alger, Jr. called The Erie Train Boy, which was first published in 1891. Alger was an immensely popular author in the 19th century—especially with young people—and his books were widely quoted. In chapter XXII of the book, a woman writes to her boyfriend, "I have a new collection of etchings that I want to show you. Won't you name an evening when you will call, as I want to be certain to be at home when you really do come." The boyfriend then writes back "I shall no doubt find pleasure in examining the etchings which you hold out as an inducement to call." 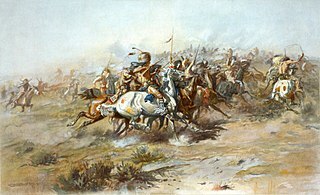 Wikimedia Commons has media related to Etchings . Printmaking is the process of creating artworks by printing, normally on paper. Printmaking normally covers only the process of creating prints that have an element of originality, rather than just being a photographic reproduction of a painting. Except in the case of monotyping, the process is capable of producing multiples of the same piece, which is called a print. Each print produced is not considered a "copy" but rather is considered an "original". This is because typically each print varies to an extent due to variables intrinsic to the printmaking process, and also because the imagery of a print is typically not simply a reproduction of another work but rather is often a unique image designed from the start to be expressed in a particular printmaking technique. A print may be known as an impression. Printmaking is not chosen only for its ability to produce multiple impressions, but rather for the unique qualities that each of the printmaking processes lends itself to. Mezzotint is a printmaking process of the intaglio family, technically a drypoint method. It was the first tonal method to be used, enabling half-tones to be produced without using line- or dot-based techniques like hatching, cross-hatching or stipple. Mezzotint achieves tonality by roughening a metal plate with thousands of little dots made by a metal tool with small teeth, called a "rocker". In printing, the tiny pits in the plate hold the ink when the face of the plate is wiped clean. A high level of quality and richness in the print can be achieved. Linocut is a printmaking technique, a variant of woodcut in which a sheet of linoleum is used for a relief surface. A design is cut into the linoleum surface with a sharp knife, V-shaped chisel or gouge, with the raised (uncarved) areas representing a reversal of the parts to show printed. The linoleum sheet is inked with a roller, and then impressed onto paper or fabric. The actual printing can be done by hand or with a printing press. Monotyping is a type of printmaking made by drawing or painting on a smooth, non-absorbent surface. The surface, or matrix, was historically a copper etching plate, but in contemporary work it can vary from zinc or glass to acrylic glass. The image is then transferred onto a sheet of paper by pressing the two together, usually using a printing-press. Monotypes can also be created by inking an entire surface and then, using brushes or rags, removing ink to create a subtractive image, e.g. creating lights from a field of opaque colour. The inks used may be oil based or water based. With oil based inks, the paper may be dry, in which case the image has more contrast, or the paper may be damp, in which case the image has a 10 percent greater range of tones. Drypoint is a printmaking technique of the intaglio family, in which an image is incised into a plate with a hard-pointed "needle" of sharp metal or diamond point. In principle, the method is practically identical to engraving. The difference is in the use of tools, and that the raised ridge along the furrow is not scraped or filed away as in engraving. Traditionally the plate was copper, but now acetate, zinc, or plexiglas are also commonly used. Like etching, drypoint is easier to master than engraving for an artist trained in drawing because the technique of using the needle is closer to using a pencil than the engraver's burin. Aquatint is an intaglio printmaking technique, a variant of etching that only produces areas of tone rather than lines. For this reason it has mostly been used in conjunction with etching, to give outlines. It has also been used historically to achieve prints in colour, both by printing with multiple plates in different colours, and by making monochrome prints that were then hand-coloured with watercolour. Relief printing is a family of printing methods where a printing block, plate or matrix that has had ink applied to its surface, but not to any recessed areas, is brought into contact with paper. The areas of the printing plate with ink will leave ink on the paper, whereas the recessed areas of the printing plate will leave the paper ink-free. A printing press may not be needed, as the back of the paper can be rubbed or pressed by hand with a simple tool such as a brayer or roller. Photogravure is an intaglio printmaking or photo-mechanical process whereby a copper plate is grained and then coated with a light-sensitive gelatin tissue which had been exposed to a film positive, and then etched, resulting in a high quality intaglio plate that can reproduce detailed continuous tones of a photograph. Photoengraving is a process that uses a light-sensitive photoresist applied to the surface to be engraved to create a mask that shields some areas during a subsequent operation which etches, dissolves, or otherwise removes some or all of the material from the unshielded areas. Normally applied to metal, it can also be used on glass, plastic and other materials. Monoprinting is a form of printmaking that has lines or images that can only be made once, unlike most printmaking, which allows for multiple originals. There are many techniques of mono-printing. Examples of standard printmaking techniques which can be used to make monoprints include lithography, woodcut, and etching. Carborundum Mezzotint is a printmaking technique in which the image is created by adding light passages to a dark field. It is a relatively new process invented in the US during the 1930s by Hubert Mesibov, Michael J. Gallagher, and Dox Thrash, an artist working in Philadelphia with the WPA). "Carborundum Collagraph" collagraph is a different printmaking technique, invented in 1952 by Henri Goetz, an American abstract artist living in Paris. The carborundum mezzotint uses the grits to create pits below the surface of the metal that then hold ink, like traditional mezzotint. The carborundum collagraph creates the image above the surface of the matrix, which does not have to be metal. In one method, the grits are mixed into a paste using an acrylic base that is painted onto the matrix, creating the image much like painting. Once dried, this holds the ink; the wiping and printing are done the same as etching. The techniques described following and below are alternatives to the paste mixture technique, yet all are creating the image above the surface of the matrix. Carbordundum collagraph allows artists to work on a large scale. Normally, cardboard or wood plates are coated in a layer of carborundum or screen, and the lights are created by filling in the texture with screen filler or glue. Carborundum prints may be printed as intaglio plates. Viscosity printing is a multi-color printmaking technique that incorporates principles of relief printing and intaglio printing. It was pioneered by Stanley William Hayter. Steel engraving is a technique for printing illustrations based on steel instead of copper. It has been rarely used in artistic printmaking, although it was much used for reproductions in the 19th century. Steel engraving was introduced in 1792 by Jacob Perkins (1766–1849), an American inventor, for banknote printing. When Perkins moved to London in 1818, the technique was adapted in 1820 by Charles Warren and especially by Charles Heath (1785–1848) for Thomas Campbell's Pleasures of Hope, which contained the first published plates engraved on steel. The new technique only partially replaced the other commercial techniques of that time such as woodcut, wood engraving, copper engraving and later lithography. All the illustrations in the Encyclopædia Britannica of 1911 are steel engravings. Vitreography is a fine art printmaking technique that uses a 3⁄8-inch-thick (9.5 mm) float glass matrix instead of the traditional matrices of metal, wood or stone. A print created using the technique is called a vitreograph. Unlike a monotype, in which ink is painted onto a smooth glass plate and transferred to paper to produce a unique work, the vitreograph technique involves fixing the imagery in, or on, the glass plate. This allows the production of an edition of prints. Maurice R. Bebb (1891–1986) was a notable etcher and printmaker of the American Midwest, whose best-known subjects were birds native to Oklahoma and Minnesota, where he spent his time. Etching involves using copper plates on which an artist has etched or “bitten” his picture with acid. Color etchings like Bebb's require two to four copper plates, each is inked with one or more different colors and printed one over the other to produce the finished picture. Technically, the process is called multi-plate soft-ground and aquatint etching. Stipple engraving is a technique used to create tone in an intaglio print by distributing a pattern of dots of various sizes and densities across the image. The pattern is created on the printing plate either in engraving by gouging out the dots with a burin, or through an etching process. Stippling was used as an adjunct to conventional line engraving and etching for over two centuries, before being developed as a distinct technique in the mid-18th century. Léon Davent was a French printmaker in the mid 16th century, closely associated with the First School of Fontainebleau. He worked in both engraving and etching and many of his works are based on designs by Francesco Primaticcio, "rendered boldly and freely". Others use designs by Luca Penni and other artists. It is thought that there was a workshop at the Palace of Fontainebleau itself in the 1540s, where he was one of the leading printmakers. Their main purpose seems to have been to record the new style being forged at Fontainebleau, copying both the main subject paintings and the elaborate ornamental stuccos and other decorations. ↑ "Etching | Definition of etching by Merriam-Webster". Merriam-webster.com. Retrieved 2015-08-11. ↑ "The Artist's Stdio : What Is Etching?" (PDF). Cairnsregionalgallery.com.au. Archived from the original (PDF) on 2015-09-06. Retrieved 2015-08-12. ↑ "Abraham Bosse" (in French). Expositions.bnf.fr. Retrieved 2015-08-11. ↑ Cohen, Brian D. "Freedom and Resistance in the Act of Engraving (or, Why Dürer Gave up on Etching)," Art in Print Vol. 7 No. 3 (September-October 2017), 17. ↑ "Illuminated Printing". William Blake Archive. 2003. Retrieved January 31, 2013. 1 2 Medley-Buckner, C. (1999). "Carborundum Mezzotint and Carborundum Etching". Print Quarterly, 16 (1): 34–49. ↑ "Glossary | Magical-Secrets: A Printmaking Community". Magical-Secrets. Retrieved 2015-08-11. ↑ "Welcome to the Office of Environmental Health and Safety | Office of Environmental Health and Safety". Web.princeton.edu. Retrieved 2015-08-11. ↑ "Traditional intaglio printmaking methods, their health hazards, new non-toxic substitutes". Greenart.info. 2013-03-14. Retrieved 2015-08-11. ↑ Nick, Semenoff; Christof, C. (1999). "Using Dry Copier Toners in Intaglio and Electro-Etching of metal Plates". Leonardo. MIT Press. 24 (4): 389–394. doi:10.2307/1575513. ↑ Robert Mankoff. "My Sexual Revolution". Newyorker.com. Retrieved 2015-08-12. ↑ Hammett, Dashiell, The Thin Man, (1934) in Five Complete Novels, New York: Avanel Books, 1980, p. 592.